Ukraine and India are expanding military technical cooperation in the area of military shipbuilding and are creating a joint venture to restore power-generating equipment on Indian Navy vessels, Indian Defense News has reported. The report said there plans are to create a joint venture in India to overhaul gas turbines of Indian warships with the participation of Indian Bharat Heavy Electricals Ltd. (BHEL) and Ukraine’s state-owned Zorya-Mashproekt enterprise (Mykolaiv). The creation of a joint venture in India is designed to optimize the current logistics of the growing Ukrainian-Indian military-technical cooperation in the field of military shipbuilding and to ensure a reduction in costs for the transportation of energy equipment to Ukraine for restoration. The turbine which is used by the Indian Navy requires overhauling after running 30,000 hours. At the same time, Indian BHEL is already cooperating with Siemens and General Electric and expects to expand the order portfolio within the new format of cooperation with the Ukrainian enterprise, the report said. The details of the investments and figures will be reviled at the time of signing the deal. 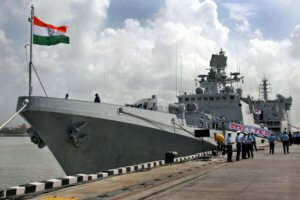 According to Indian Defense News, the Indian Navy will soon have 34 warships using Ukrainian power equipment. Zorya turbines are extensively used in major Indian naval warships which includes five Rajput class destroyers, three Delhi class destroyers and 16 fast missile corvettes of the 1241RE class. Zorya-Mashproekt declined to comment to the Kyiv-based Interfax-Ukraine news agency about cooperation plans with India, citing the confidentiality of the negotiations in progress. Zorya-Mashproekt is a world-famous developer and manufacturer of gas turbine equipment and has been a part of Ukraine’s state-owned Ukroboronprom concern since 2011.